Contacts For Kids with specialized contact lens exams and fittings for your active children and teens. Kids today are more active than ever before. Whether it is hockey, soccer, karate, ballet, cheerleading or football there is a contact lens available to fit your child's specific needs. With all the recent improvements in contact lens design, the eye doctors at The Eyexam Group is successfully fitting more kids with lenses than ever before! Our Independent Optometric Physicians offer professional, personalized service for all ages including eye exams specifically for contacts. The Eyexam Group specializes in custom contact lens eye exams and contact lens fittings for the perfect fit for your child's active lifestyle. 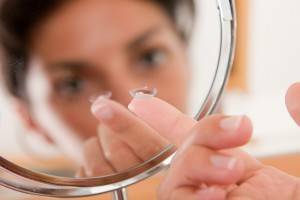 All in our Paramus, NJ office, our eye doctor's spend the time with each patient to ensure the best possible fit and help determine whether contact lenses are the best corrective lens solution for your child.